A charming, beautiful home in the Irish Hills area of southeastern Michigan. 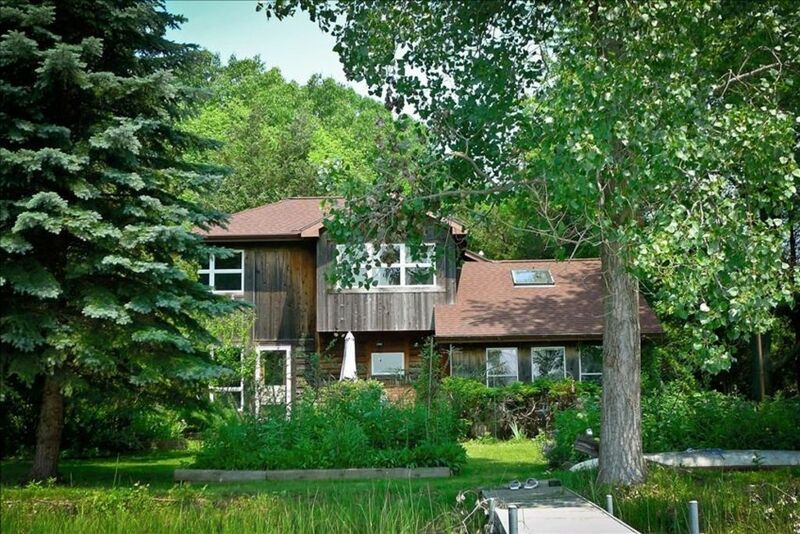 The home is in an extremely quiet and private location on Little Stoney Lake. With beautiful architecture and an idyllic natural setting next to a state preserve area, this two story house is ideal for relaxing and rejuvenation for families and small groups. All rooms have stunning views of the lake or woods nearby and the landscaped lawn, gardens and deck lend themselves to observing herons, swans, goldfinches and other birds and wildlife and enjoying the changes that the seasons bring to the lake the adjacent woods. The beach and dock are steps from the deck and are perfect for swimming, fishing, or just taking in the sun on lazy summer days. Take the kayak or rowboat out on the lake to explore the shoreline or get friendly with turtles on the branches in the shallows. Or, step out the front door and discover the hiking trails that traverse the state reserve for long walks, finding morel mushrooms, and exploring the woods. So quiet and secluded but still only a very short drive to all that the Irish Hills and the quaint village of Brooklyn have to offer: Hidden Lake Gardens; golf courses; Michigan International Speedway; wineries; shops and restaurants; and much, much more. Or take slightly longer trips to enjoy the many attractions offered by the nearby cities of Jackson, Adrian, and Ann Arbor. Great place to stay over during University of Michigan or Michigan State University football game weekends. Easy access to both Ann Arbor and East Lansing. Three bedrooms plus a loft room for reading or sleeping, two bathrooms, laundry facilities, gourmet kitchen with dish ware; charcoal grill, two car garage. Indoor and outdoor entertainment available: large lawn with gardens, 2 kayaks, row boat, fishing poles, fire pit; two televisions with cable, DVD player (note: TVs are in bedrooms, not common room). Master bedroom has sliding glass door on to deck. Additional beautiful home on a hill adjacent to the property is also potentially available for rent for large groups. Available for rental on monthly basis between January 1 and April 30. Also large freezer in garage. Small deck off living area. Patio in the yard with a fire pit. Set almost in the woods. Very tranquil on a beautiful lake.Had everything you could want in a vacation home. We were so pleased with this house. Private location at the end of the road. This small lake is just perfect for the paddle boat and Kayaks that are furnished. We are definitely considering returning. We had a wonderful time spending the weekend at this property. This was our first attempt at a family weekend away and we are already looking forward to doing it again! The house is perfect for large groups, has a well stocked kitchen and the location (at the end of a low-traffic street) gave us the secluded cabin feel we were looking for. We enjoyed the kayaks, fire pit and on a hot week, the AC! We had a great time with family! The lake was quiet and our grandchildren had great fun. The house was very clean, and we would love to go back. Lovely cottage on a quiet lake. The house is comfortable and full of interesting items reflecting a lifetime of travel and literature. The house is fully equipped for your stay. We loved paddling the kayaks across the lake. Communication was excellent. Thanks for everything, we hope to book again in the future. Adjacent to a beautiful state park with trails. Cleaning fees that exceed the base allowance will be paid from the refundable security deposit.